Brigid herself was pleased with the joyous celebration of the day of the return of the light. She was aspected by our very own adviser April, in a wonderful black and white costume, signifying the duality of the solstice and equality of day and night before the day becomes longer. The four quarters were called upon with candles and wreathes upon the heads of those who were in their elements respectively. A roaring fire in the grill helped keep us warm on the chilly night, and light Brigid’s candle. Milk and oats were passed, and blessings given, and blessings received. Thanks to all who came and enjoyed and made Imbolc 2011 a reality. Following Imbolc we had home made chicken soup and participated in a new moon ritual. We hailed Luna and meditated with the beating of drums and set goals for the coming month. 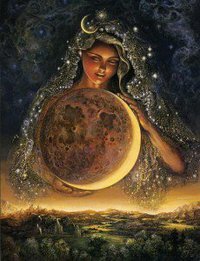 Blessings of the moon were given by the Priest before everyone was led into past life visions by April. Many things were revealed. All very instructional and helpful to the people to better understanding their time in this existence. All in all, we can’t wait to do it again! Come join us each month for new and full moon rituals and draw down the power of the moon into your lives. See you there!